Looking for a role in the multimedia industry? 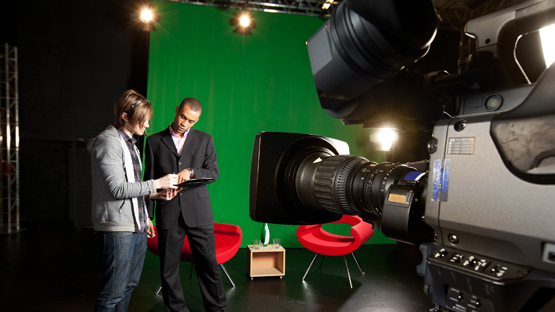 Our four-year TV production degree might be your ticket to a career. Whether your dream is to be behind the camera in traditional media formats or on the Web, this program is designed to provide you with the hands-on, practical skills you need. Courses cover cinematography, scriptwriting, Web design, production, editing, funding, and more. Taught with cutting edge technology by an experienced faculty, this academic program will prepare you to excel in the creative and competitive field of media production. The Bachelor of Applied Science (B.A.S.) is the designated degree for flexible baccalaureate programs that are designed to accommodate the unique demands for entry and advancement within specific workforce sectors. B.A.S. programs provide degree completion opportunities for students from a variety of educational backgrounds but primarily for those with A.S. degrees or the equivalent. B.A.S. degree programs are included in our transfer agreements with other institutions and typically include capstone experiences that provide opportunities for students to demonstrate the application of acquired knowledge, skills and competencies. Ready to take the first step? Applying to the College is quick and easy. Get started today.